I recently purchased a 2008 Hyundai Santa Fe because, sure, why not buy a small SUV when gas prices are approaching $4/gallon. Despite many of their other models being equipped with one, Hyundai in its infinite wisdom decided not to include an auxiliary input as part of its stock Santa Fe CD stereo - hence, no iPod. Because I refuse to screw around with those worthless FM transmitters, I've been forced to listen to the three-month trial period of XM, which is actually pretty decent. 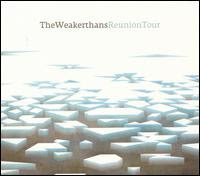 From that experience, I have "discovered" (at least) one band previously unknown to me, The Weakerthans. I've heard their wonderful Sun in an Empty Room on XM's Verge channel on more than one occasion. The damn tune is jammed in my consciousness, which is not a bad feeling at all. It is deceptively bright, yet quite a bummer of a tune. It's the musical embodiment of a Hopper painting. Considering one of his last paintings was called Sun in an Empty Room, I can't help but assume The Weakerthans are intentionally making that connection. View the painting then listen to the tune - it's a personal multimedia experience. Sun in an Empty Room is the perfect anchor to their solid fourth album, Reunion Tour. Punk label Epitaph released it last fall, but its overall sound might better fit in with what you'd expect from Barsuk or latter-day Sub Pop (think Death Cab and Postal Service by extension, Shins, Nada Surf, and even They Might Be Giants.) Very nice and highly recommended.